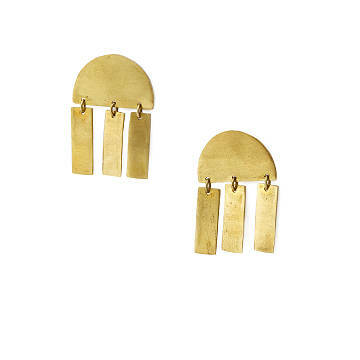 This bold, brass interpretation of fringe-y tassel earrings helps its Kenyan maker earn a good living. A gleaming new take on a go-to bohemian style, these earrings bring brass boldness to tassel jewelry. Eye-catching “fringes” shift with the wearer’s every movement, catching the light—and nearby eyes. The Kenyan artisans who make them using traditional, simple techniques work with Nairobi-based fellow B Corp Soko to stay plugged into the world market. These women have been able to increase sales and raise their incomes while working close to home and taking care of their families. It’s a shining example of win-win. Handmade in Kenya.